The Community Tournament Has a Top 8! After two rounds, we're down to our top 8 competitors in the first Kingdoms CCG Community Tournament. Lollipabbi, running a Devroth Elf deck clobbered their way through two Construct decks to make it into the top 8. 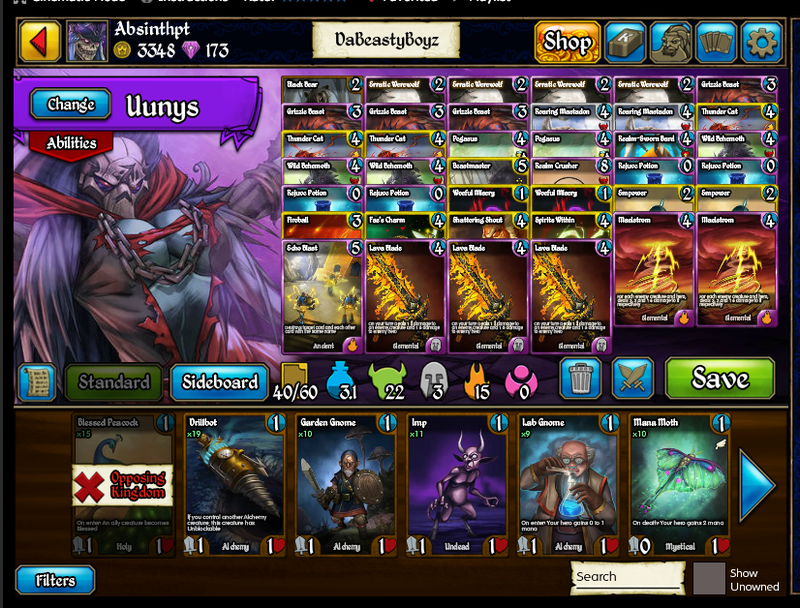 Absinthpt, running a Uunys focused Beast deck, won the mirror match with Kickbutte's Beast deck. KKannon used his Devroth Wizard deck to lock down Hopeprevails' chance of winning on the backs of three Frostwielders and a timely Realm Crusher. SupernovaK stole victory using a Nomad Rogue deck against powerful Titans. This rogue deck is... ahem... uncommonly good. Limits beat Nabaxxen's surprising Barrier deck using an Ichor Titan deck sporting two freshly buffed Morningstar of the Ages. 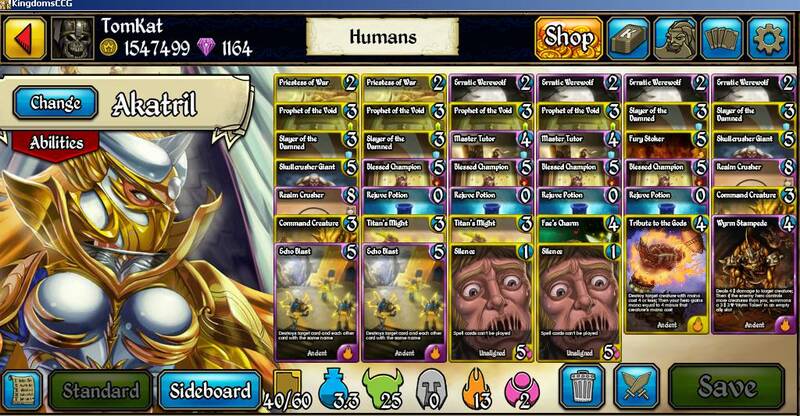 Tomkat battled his Akatril Human deck through Giants and Warriors to secure another spot for the Holy kingdom. Wherewolf0 brings a "message of hope" to the top 8 with his Raise the Guard fueled Belnir Angel deck knocking out Elves and Titans on his way in. VViki rounds out our top 8 with his teched out Ravinova Cleric deck that beat Horrors and Elementals on the way. The full bracket can be seen HERE. Will the 4 Holy decks beat their opponents for an all-Light final? Find out tomorrow by following the action in our tournament forum. We've received lots of good feedback from this event and will be running more in the future. Stay tuned to this blog and our forums for the latest community event info! Final Weekend for Gem Sale... and more! Just a reminder that this is the final weekend for our big Gem Sale. If you'd like to get 20-25% off the price of Gem Packs, don't wait! The sale will be taken down early Monday morning (around 9:30 EST). Also starting this weekend we are running our first Community Tournament with 26 players battling it out with their best Tribal decks. You will be able to follow all of the action and check out the decks played in our forums here: Community Tournament and follow the match up results here: Tournament Brackets. Come cheer them on! 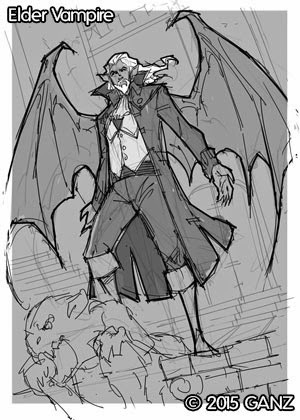 Finally, our next expansion will be going into Beta testing next week, and to whet your whistle while you wait for it, here is a sketch of one of these new cards. Release Notes... and Gem Sale! New, better starting decks for new players. 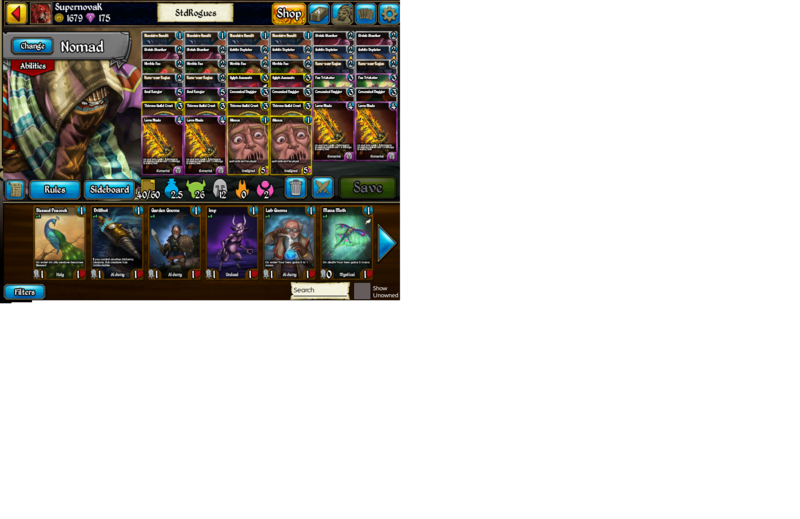 Reduced singles prices for all Gem priced commons, uncommons, rares, Tribes Epics, and all Legendaries. See out previous blog post for more discussion on Epic card prices. AI Fix: Fliers will no longer set themselves to defend against non-fliers. Revised the deck building rules to the Kingdoms format to make it more new player friendly. Rules have been added to deck builder. See below for more details. The Draft format has been removed from the free tournaments. In its place we've added Pauper and Kingdoms constructed, and Tribes Sealed. The new tournament schedule will begin tomorrow. Nomad, Ichor, Thania and Devroth will now appear as rotating heroes and will appear in Arena quests. Nomad's gold cost has been reduced to 70,000. Quickdraw Cannon will now destroy itself if it triggers 5 times on a single turn. Note: Each QDC has its own trigger count. Gift of the Mystics now only affects the next 4 cards you play. Light Ascending: As our first set, we are proud of the quality of cards put into Light Ascending. Many of the cards have had a significant impact in the overall environment and the reaction to the set has been largely positive. This said, we recognize that we didn't get the power level right on some of the cards. Some cards like Skullcrusher Giant skewed too high, and others, like Elder's Hammer, were the lowest in the game. We're now fixing some of these cards. Morningstar of the Ages has been reduced in cost to 3. Skullcrusher Giant now only removes 2 charges when attacking. Manacycle Wizard has been given Allegiant back. Note: She will never, ever, ever be getting her card draw back. Known Issue: Mind Over Body has a known bug. If played in a discard with spells, it will recur the spells, but NOT place creatures into the discard pile. It WILL place creatures into an empty discard pile. We will be fixing this bug. Maximum of 3 copies of any single card. ALL cards in the deck must be either Unaligned or belong to the Kingdom of your chosen hero. The Kingdoms Constructed Format will now appear in free tournaments. For the next week (until March 30, 2015) all Gem Packs are on sale for between 20-25% off. Enjoy! Since Ganz took over the game from Antic we've made a number of changes to the game, some loved, some... no so much. We have some new changes coming in our next release that we now want to tell you about, and discuss some of the key topics that players have been asking about. Let's get the big one out of the way first. In our next release we will be reducing the overall cost of singles. This has been the number one request of players since we made the initial changes to the marketplace, and we're now readjusting these values. Commons, Uncommons and Rares have had their cost ranges lowered, with the most significant drop being to Tribes Uncommons, which will now max out at 29, lowered from 59, which was unduly high. 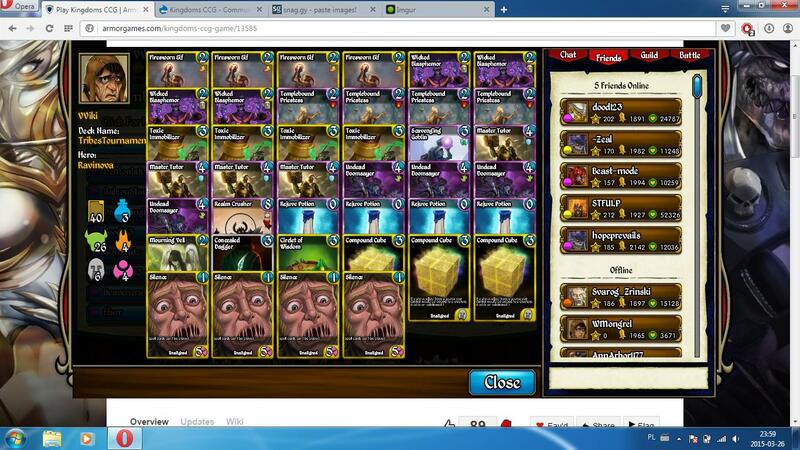 All Legendaries will also be dropped 100 Gems to a fixed price of 399. Finally, there are the Epics. While Tribes Epics will be reduced in cost from 99 to 89, these will not be made dynamic at this time. We can now announce that we are actively rewriting the Dynamic Market code. While this rewrite will not be ready for this release, we fully intend to have it ready for the release after. The new system will be a more accurate reflection of the cards making an impact in the metagame and will not be subject to wild ups and downs. When this new system is released, the price range for Epics will be expanded. There will be low cost Epics and high cost Epics, and unlike today's system, almost every price in between, making for a truly dynamic market. Many players have offered suggestions on how to improve the Tournament system, and we agree that the system is not working the way we'd like. You should be able to join a tournament regardless of when you find time to play and that is our long term goal. Of course rewriting this system will not be easy and will take some time. In the meantime, what we can do is offer up better tournament options! We've heard you loud and clear that Draft tournaments take too long for the free events, and so, with our next release we will be removing all Draft events from our free feeder tourneys. 1) Tribes Sealed - finally! 2) Pauper Constructed - build decks out of just Commons and Uncommons and battle for supremacy! 3) Kingdoms Constructed - an old format revised and brought back as a great option for new deckbuilders. We'll be outlining the changes in our release notes. And on the topic of new players, we have updated the starting decks that new players will receive, giving them a better base to build from. 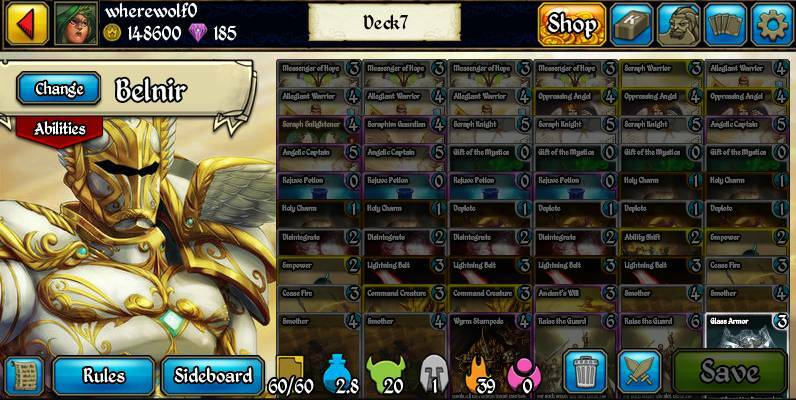 The new decks now include 2 rares each and a few popular cards from Eve and Rise like Pacify and Inner Fire. 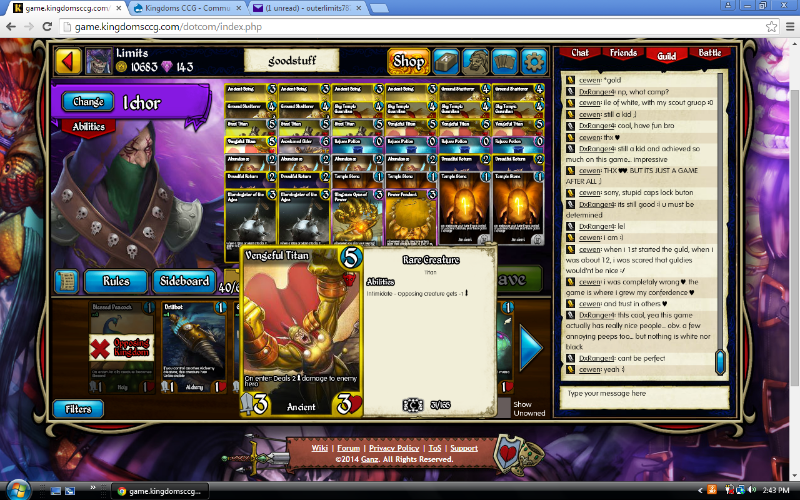 Finally, guilds. There has been a lot of talk on the forums about changes to Guild structure, war system and prizing. With our focus on other areas of the game and new content, we have not spent a lot of time in the Guild code. We understand that Guilds are very important to most of you and we will be looking at what can be done to improve the overall experience. As a past Guild player myself, I can understand all of the issues that are being raised, and I think that the conversation is very fruitful. Let us say that it is our goal to encourage all players to get involved in guilds and want to have prizing that rewards players for their level of activity regardless of their "tier". We will be discussing this more in a future announcement as we narrow down the best options for making our Guild system the best that it can be. New to Kingdoms CCG? Join our first Community Tournament! Since the release of Light Ascending and our release on Steam, we've had an influx of new players trying the game. As a special event for these new players we're running our first Community Tournament. We're looking for 32 players who started playing after January 1, 2015 and would like to compete in a fun, casual event. The top prize is 2 Epic rarity cards of your choice plus 60 Gems, while every player who plays will receive 10 Gems just for participating. For all of the details, and to request a place in the tournament, go to our official forum. Sign up today! Are you a veteran? Our next Community Tournament will be for you! The new heroes of Euna have arrived! 1) New Heroes Added: Thania, Devroth and Ichor have been added to the game. They are currently available in the Shop for 90,000 Gold or 69 Gems. Note about the new heroes: This is the first time that completely new heroes have been added to the game in years. The heroes were tested by a number of your fellow players on a Beta Server prior to release. Thanks to these testers, we feel that the balance of these new heroes is largely correct. The only debate was with Devroth's ability "Exile from Battle". Some players felt it was fine at the current 6, while other felt it should be moved to 7. This ability will be watched and a change will be made if the results show that it is necessary. A big thanks to all of the Beta testers for their help. 2) The ability Recycle is no longer random. Upon death a creature with Recycle will grant its Hero charges equal to its Recycle value. 3) With this new definition of Recycle, Enigma of the Unknown now has a Recycle value of 2. 4) We've added a special offer for the month of March: the Epic Pack. This pack contains exactly 3 cards, each of which is an EPIC (Purple) card. The Epics are taken from Eve, Rise, Tribes and Light Ascending - you will NOT receive any Core Epics in these packs. Each pack also comes with a guaranteed crafting stone and a good amount of essence. Note that if you purchase this pack from the front screen you will not see the pack animation but your cards WILL be awarded (you will get a message "The item has been added to your account instead"). 5) Zero energy costs nodes no longer pay out gold for a loss. Nodes with an energy cost will pay out as they always have. 6) Numerous security enhancements have been made to the game to keep your battles secure and fair. 7) An achievement has been added for completing your collection of Light Ascending. Stay tuned as later this week we will be announcing what we have planned next! For our final new hero preview, we bring you a dark and twisted hero whose very name oozes from the veins of the dead... Ichor. 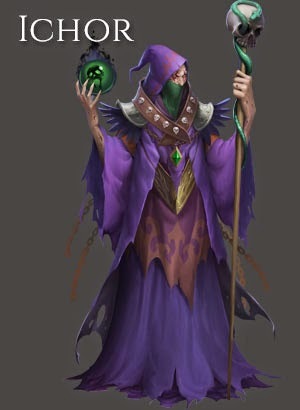 His description: "Obsessed to point of madness, Ichor will stop at nothing to twist the line between life and death. Wars can only be won if your enemy can be killed and with dark magic, death is only a minor annoyance." The Undead Kingdoms has always excelled at returning the dead to the land of the living, but Ichor takes this to a whole new level. Ability 1: Dredge: Draw a card. Your hero Mills 2. A simple ability that gets to the corrupted heart of this new hero. Ichor aggressively puts cards into his own discard pile, then uses these cards for his evil machinations. Ability 2: Wrath of the Dead: Your hero Mills 1. Target creature loses health equal to the mana cost of the milled card. This is potentially the most powerful creature kill ability so far. Hit the right card and you can mow down creatures regardless of their size or abilities. Eternal Dragon or Eternal Protector in your way? As this is direct HP loss, those abilities don't come into play. Now yes, you can hit your Rejuve Potion and hit for zero. Perhaps build with no Rejuves? He has gone mad, why not you? Note that cards like Rapid Prototype can now play double duty filling his charges and acting as a powerful flip for this ability. Ability 3: Raise Minion: Put the top creature with mana cost of 7 or less from target Hero's discard pile into play in an empty ally slot. And finally his ultimate. Pick a discard pile. Put the top creature into play. No corpse needed. No randomness. Yes, for balance we had to prevent Ichor from popping up Realm Crushers, but Bruisers from Beyond are a nice option to fall back on. So there you have it - a powerful new Undead Hero to build around - a dark foil for the two new Light Alliance heroes. When will you get your hands on these fun new options? Today we meet the new Holy hero who has seen the ravages of war and now straddles the line between Light and Dark... General Devroth. 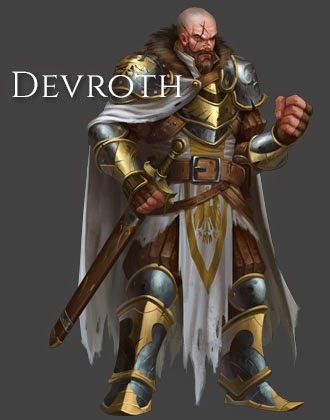 His description: "While war torn and battle weary, Devroth will never lay down his sword. He now recruits from all sides and rallies his young troops for battle, for nothing will stand in the way of victory." Devroth is an aggressive hero built around using the smallest creatures in Kingdoms - those that cost 2 or less - and turning them into a lethal force. And his ultimate... let's just say that Devroth won't even let a Guardian of the Old Gods ruin his battle plan. Ability 1: Battle Regiment - Target creature of mana cost 2 or less gains +1/+1. +1/+1 is extremely strong for a first ability, but it is balanced by the mana cost limit. The potential here is huge, from 2/2 Swiftshot Rangers, to 3/3 Dryad of the Watch. A great start to an effective ability set. Ability 2: Enlist - Summon from your deck the next creature with mana cost 2 of less into target empty ally slot. Tokens are for the weak. You brought an army... use it! 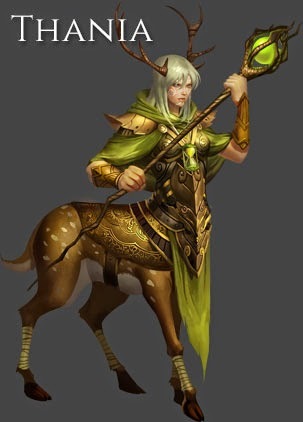 Devroth can add a creature to the battle field for free with his second ability, and can place this creature where he pleases (useful for calling forth a recruited Firesworn Elf). Ability 3: Exile from Battle - All creatures with mana cost 3 or more become 1/1 Peasant tokens. 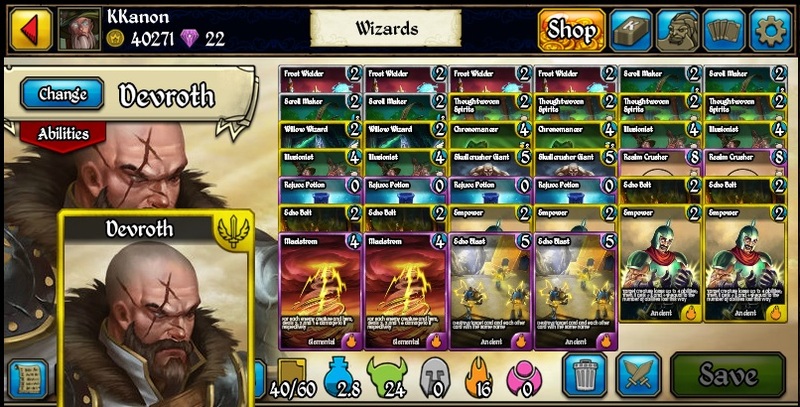 Much of the Kingdoms CCG meta is built around large creatures - GoOG, Realm Crusher, Skullcrusher Giant - all of which can give a small creature deck a serious headache. Devroth laughs at these monstrosities and yells "To the farmstead with you!" Yes, every creature with a mana cost above Devroth's 2 or less will be sent away from the battlefield and replaced with a simple 1/1 Peasant (your creatures include). This is an ability unprecedented in the game and even creatures such as Justice and Elara are not immune to Devroth's decree. If there is one new ability that will shake up the environment, this is it. An update on the Watch List announce a few weeks ago. We have added two cards to the list and removed one. Quickdraw Cannon: One of the most hated cards in the game for years, "QDC" has reared its ugly head again and the call for something to be done about it has been made. You can get into the discussion here: http://forum.kingdomsccg.com/?q=node/8266&page=1 The community has raised numerous fixes to the card and we are listening. Gift of the Mystics: The fuel that makes QDC work. Gift of the Mystics is an odd card, particularly for a core set, in that its benefit is almost exclusively to combo decks. In QDC (or any future draw-based deck) GotM can save 5+ mana in a turn easily, giving a mana benefit much higher than even Relinquish which actually has a downside. Fae Paragon: While Fae Paragon is definitely the strongest of the tribal "lords", he has not proven to have made an unbalancing impact in any format. We've seen some solid Fairy decks put up good results and that's what he was designed to help do. Fae Paragon is therefore no longer on the list. Her description: "Born of mystical magic in a temporal rift, Thania has been a creature of pure power her entire life. The youngest of the heroes, her abilities now rival the most seasoned champions." Ability 1: Hold - Target creature becomes Slow. A simple ability that may seem underpowered, but is surprisingly effective. Holding off Skullcrusher Giants, Scavenger Goblins, and Bruisers from Beyond for even a turn can give Thania the time to win the game out of nowhere. Combine with Circlet of Wisdom to ensure that your opponent doesn't hit you with Haste before you can apply that Slow. Ability 2: Temporal Twist - Draw a card. Enemy Hero puts a card from hand onto the top of their deck. This is a deceptively powerful ability that simulates Thania bending time upon itself. Similar in effect to Nomad's Acquire, you gain a card, and your opponent loses one. But here you draw from your deck, so the card you're gaining is guaranteed to fit your strategy. Ability 3: Step Through Time - After this turn, take another turn. Your Hero cannot gain charges during that turn. Take. Another. Turn. You read that right. Possibly the most powerful ultimate ability ever. So powerful that we had to add a caveat to that turn so that you can't "go infinite" easily. Note that this prevents all charges from being gained during that turn - from Rejuve, Charge Potion, etc. But this extra turn can give you the chance to get in that fatal blow, or set up your combo, or, you know, play Flashback and keep the fun going. What are the charges for these crazy abilities? Wait and find out when Thania and her cohorts arrive in Euna very soon!